New clinical study conducted on Glucosprint® by Dr. G. Corigliano and Dr. C. De Fazio of the Diabetes Center AID in Naples in collaboration with the National Italian Association of Diabetic Athletes (ANIAD).The study results show that Glucosprint® is “the product of choice for the resolution of hypoglycemic events related to physical / sport activity”. Hypoglycemia affects a large majority of people living with diabetes. If the hypo is not detected in time and / or the carbohydrates intake is not adapted, the consequences can be dramatic. Dextrose guarantees a very rapid increase of the blood sugar level: in fact, this type of carbohydrate has the highest glycemic index, equal to 100. This index allows to measure the impact on the increase of blood glucose level for any carbohydrates source. By comparison, the glycemic index of sucrose is equal to 65 and is commonly used in situations where blood sugar level is too low. Hence, the 15g of Dextrose included in Glucosprint Plus® ensures a very rapid rise in blood sugar level and a measurable and controllable effect, without fear of the rebound effect. Moreover, Glucosprint Plus® comes in very convenient and discreet vials, easy to carry at any time anywhere, in pocket or a purse. 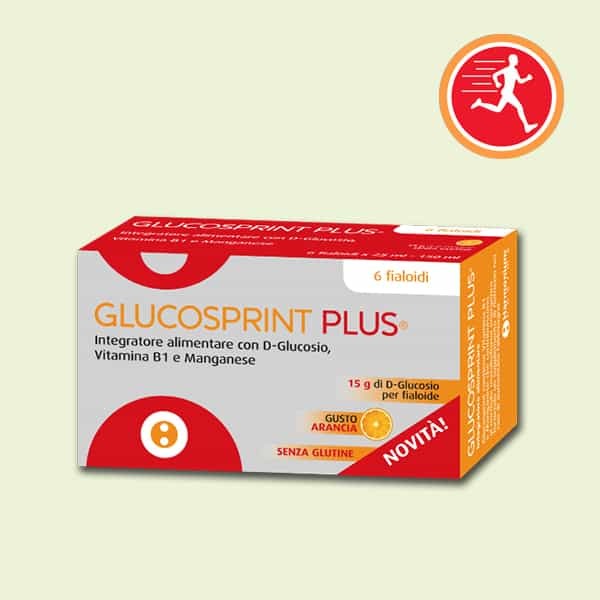 Glucosprint Plus® is a quick and efficient solution to treat low blood sugar level. It contains dextrose vitamin B1 and manganese that contribute to a normal energy-yielding metabolism. Clinical study on the treatment of hypoglycemia during physical / sports activities with Glucosprint®, G. Corigliano, C. De Fazio, Diabetes Center AID Naples in collaboration with the National Italian Association of Diabetic Athletes.